This piano is open to play 24/7. It was decorated by Hannah Davis, and it is piano 9 for the People’s Choice vote. K-9 Jynx, one of the dog's featured on the piano, visits on Friday, April 21! Great spot Hannah! Thanks for letting me let out my inner STARR. 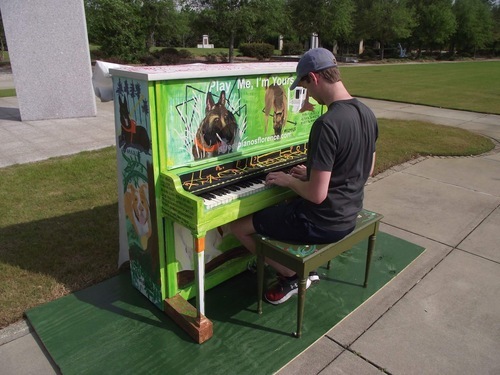 This piano was created to honor the 47 children currently missing in South Carolina and the all-volunteer search and rescue team based out of Swansea, SC, the STARR (Search, Tactics, and Rescue/Recovery) Team. The piano features 6 K-9s utilized by the team in their efforts to search for the lost and missing.